It’s been a week since I last updated this about my progress in ranked games. It took me a week to play five more ranked games... and it’s kind of interesting as to why. All of a sudden, I found myself with a semi-regular group of people to play with. All of a sudden, I was able to play and talk to people and feel like part of a group. All of a sudden... ranked games became unimportant. I obviously didn’t ignore them completely, of course. But it’s interesting, to me, how they lost a fair amount of importance. Playing with a regular group of people has made me really appreciate having a regular group of people to play with. Going back into solo queue after that has been somewhat harrowing, experience-wise. I’ve been fortunate enough to not have incredibly toxic teammates (other than a Jinx who raged at me for a while in the beginning of the game), but I can see now why people avoid playing alone. All that said, I finished up my ranked matches in decent fashion. Game 6, I played Blitzcrank support. The most notable things from this matchup are that the enemy team had a Soraka playing mid, and that said Soraka quit mid-game. I went 1-0-7. Game 7, I played Dr. Mundo top. I got completely wrecked against a Riven, who essentially demolished our entire team. I went 2-8-4. Game 8, I played Teemo top. I actually beat the Garen that was in lane pretty well, but the enemy team just overwhelmed us, eventually. I went 7-7-3. Game 9, I played Ashe ADC. There was a toxic Jinx on the enemy team who apparently made everyone’s lives hell. I went 12-9-2. Game 10, I played Veigar mid. Veigar is one of my favorite characters to play, but since mid typically gets called pretty quickly, I don’t play him much in 5v5s. I was up against a Heimer, which was rough in the beginning. It worked out, though. I went 5-1-7. 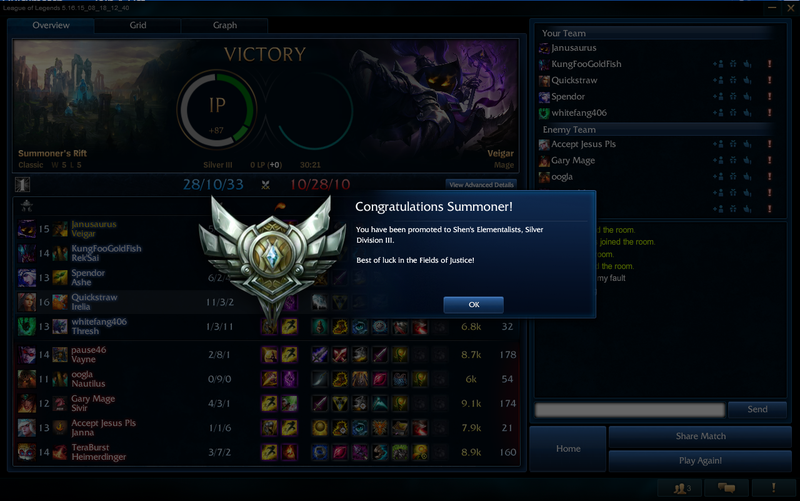 In between games 7-8, I spent some time in non-ranked games, trying out jungling. The general consensus of my teammates is that I need more work on it. I tend to agree with them. So, now that I actually have a ranking, I guess I need to play and try to improve it. I won’t be reporting about that, as I feel like it’ll get stale - but I’ll try to write things about other topics too. Suggestions are always welcomed! Thanks for reading!